U.S. Customs used the Defender it seized in April as very public showcase for its efforts to end illegal imports. The Land Rover Defender can take a tremendous pounding in the world's harshest settings: jungles, tundras and deserts. But it can't survive the Baltimore claw. In April, U.S. Customs and Border Protection seized a Defender illegally imported into the port of Baltimore from Great Britain, a trend that has been bubbling under the radar for years. The federal government allows vehicles at least 25 years old to be legally imported without having to meet crash and emissions regulations. Because the classic off-roader is highly sought-after in the United States, it's worth much more here than overseas. Land Rover imported about 7,000 Defenders, both wagons and soft-top models, from 1993 to 1997, but it had to discontinue U.S. sales because the vehicles no longer met safety requirements that took effect in 1998. Those Land Rovers are highly collectible and have retained nearly all their value. The price of a North American-spec Defender from the 1990s is somewhere between $35,000 and $70,000, according to prices paid on eBay Motors. But the same basic vehicle can be bought in Europe for around $5,000 and shipped to the United States for another $2,000 or so. Land Rover fans and some unscrupulous old-car dealers know that because the basic look of the Defender has not changed in decades, it has been fairly easy to slip a late-model Defender through customs. They do it by affixing the vehicle identification number tag from a Defender at least 25 years old to the newer model. The original Mini Cooper, whose production ended in 2000, is another vehicle that has been widely imported illegally by registering it with an older vehicle's identification number. Recently, customs has been cracking down on illegal imports. The agency used the Defender it seized in April as very public showcase for its efforts to end the practice. This month, customs officials destroyed the iconic vehicle in spectacular fashion at an undisclosed Baltimore junkyard. 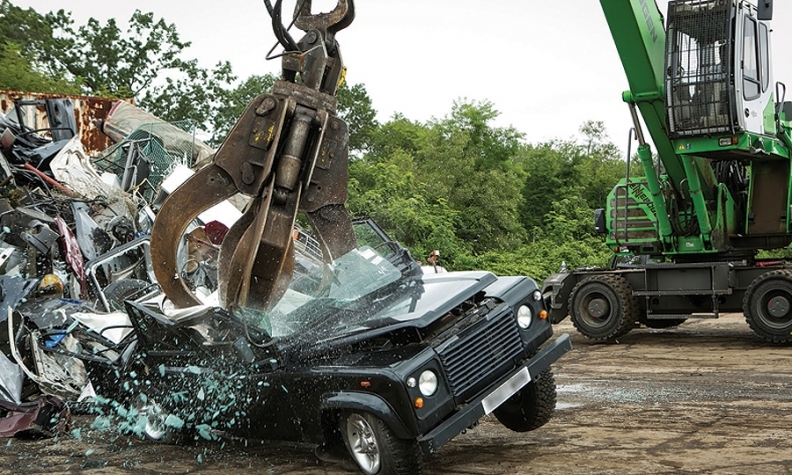 A giant claw came crashing down on the hapless black Land Rover before picking it apart and then depositing the bent and twisted remains of one of the crown jewels of the British auto industry ignominiously on a scrap heap. Customs documented the destruction in a video (autonews.com/baltimoreclaw) and let reporters witness the Defender's demise. Land Rover spokesman Stuart Schorr said Land Rover officials are aware of the black market for Defenders in the United States. The company, he said, has been quietly working with customs, showing officers how to identify Defenders and tell new from old. "The car is so rugged and good looking that it commands a premium among auto enthusiasts, and they are hard to get," Schorr said. "People who have the resources for these kinds of things don't like to be told they can't get what they want." Land Rover is working on a successor to the current-generation Defender, which is still produced. The plan, Schorr said, is engineer it to meet world safety and emissions standards, which could open the door to its return to the U.S. market. He said the fact that some people are willing to risk fines and perhaps jail for falsifying the VIN of a Defender doesn't have an impact on Land Rover's future product planning. "That doesn't color our decision; it is a microniche that doesn't represent a business case by itself," he said. There wasn't much talk about customs' demolition of the Defender inside Land Rover last week, although many employees knew about it. After viewing the video, Schorr said: "It's a shame to see such a wonderful and iconic vehicle destroyed as a result of illegal activity."